01:10:00 Makes 36 servings, 1 square (31 g) each. Makes 36 servings, 1 square (31 g) each. 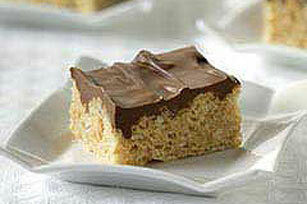 Everybody's favourite crispy treats are topped with chocolate and peanut butter. These no-bake squares are simple and delicious. Stir in peanut butter until blended. Add cereal and nuts; mix well. Press onto bottom of 13x9-inch pan sprayed with cooking spray. Microwave remaining ingredients in small microwaveable bowl 1 to 1-1/2 min. or until completely melted, stirring every 30 sec. Pour over cereal mixture; spread to cover. Refrigerate 1 hour or until chocolate mixture is firm. Melt butter in large saucepan on low heat. Add marshmallows; cook and stir until marshmallows are completely melted and mixture is well blended. Stir in peanut butter; remove from heat. Add cereal and nuts; mix well. Press onto bottom of 13x9-inch pan sprayed with cooking spray. Cook remaining ingredients in separate saucepan on very low heat until chocolate and chips are completely melted and mixture is well blended, stirring frequently. Spread over cereal mixture. Refrigerate 1 hour or until chocolate mixture is firm. Serving Size Makes 36 servings, 1 square (31 g) each.